This year’s Suzuka 8-Hour got off to a soggy start, eventually cutting the full running time to six hours and thirty-five minutes. The TSR Honda team that included Jonathan Rea got off to a strong start and lead during the early stages of the race, however Kosuke Akiyoshi had a huge off at the 130R corner, breaking his femur in the process. It didn’t stop him from getting the Fireblade back to the pits though and the team eventually finished down in 40th. The early exit of the TSR Honda allowed the Musashi team, winners of last year’s event, to claim its second Suzuka victory on the trot. The Japanese team comprised of Leon Haslam, Takumi Takahashi and Michael Van der Mark and finished a minute ahead of its nearest rival after 172 laps. In second place was the Yoshimura Suzuki team of Takuya Tsuda, Randy de Puniet, and Josh Waters. The Suzuki legends team only manged six laps before Nobu Aoki crashed and was taken away to hospital. 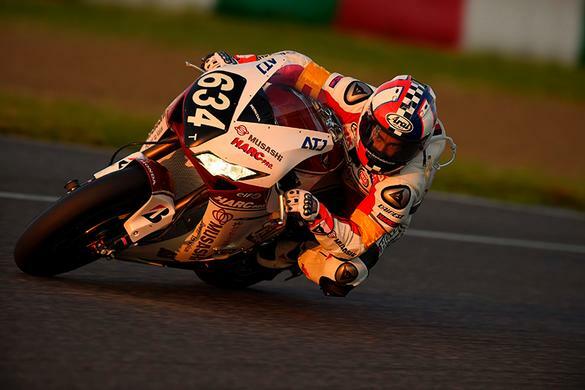 This meant Kevin Schwantz didn’t get to turn a single lap in this year’s Suzuka 8-Hour, a huge letdown for the American who claimed a podium in 2013. Taking the final podium position was Team Kagayama – the team that Schwantz raced with last year.. Comprised of Noriyuki Haga, Dominique Aegerter, and Yukio Kagayama, it’s the second time in a row now that Team Kagayama has taken the final podium slot at Suzuka.